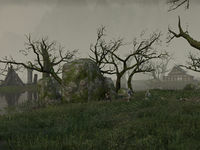 North Shore Point is an island in the lake east of Westtry in Glenumbra. A zombie named Asard the Putrid resides here. Kill the Bloodthorn zombie, Asard the Putrid, at North Shore Point.